UNO is one of the most popular card games of the moment, due to its very easy rules and the insane amounts of fun it can provide. Of course, we know about some situations in which this innocent game lead to some anger bursts from people who weren’t used with losing, but that’s another story. It’s suitable for ages 7 and up and a quick, simple game can end up with a whole night of playing it. Still, in order to totally enjoy it, you need to know the rules. 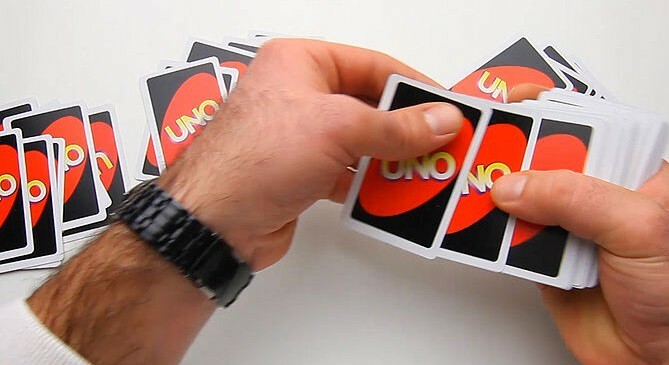 Even though they are very simple, you must go through them before playing your first game of UNO. For those of you who are new to the game, we’ve made this full guide on how to play UNO, starting with the basic rules of the game and ending with some hints which should help you win more often. So, without much further ado, let’s begin, shall we? In order to play UNO, you need a deck of cards. The standard one has 108 pieces. Each type of card has its specific role in the game, but we’ll get to that later in the guide. Basically, there’s no player limit in UNO. You need at least another friend to play with, but we’ve seen groups of ten people playing and enjoying it to the max. The whole purpose of the game is to get rid of all your cards the first. In order to start, you need to pick a dealer. Each player picks a card from the deck and the one with the highest number is the dealer. Action cards, including Wild and Wild Draw Four cards, have zero value, so only numbered cards count. Each player gets seven cards, while the remaining ones are placed face down in the middle of the table. The stack is known as the draw pile. Finally, the dealer gets to turn over the top card of the draw pile and the game can begin. 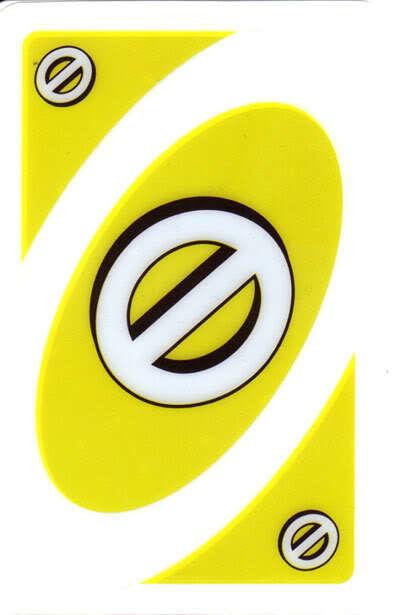 In UNO, the turns begin with the player positioned at the dealer’s left and go clockwise, around the table. You need to place one of the cards you were give on the draw pile. The card must have the same color, number or wording as the top card on the discard pile. Still, if you have a Wild card, you can choose which color cards will be played. If you don’t have any card to discard, draw a card from the draw pile. If this new card is eligible for the discard pile, place it there. Otherwise, it’s the next person’s turn. Like mentioned above, there are three type of action cards in UNO: draw 2, reverse, and skip. Draw 2: Just like its name says, when a player discards it, the player two his left must draw two cards from the pile. Of course, if he also has a Draw 2 card, he can use it against the next player and so on, until the game reaches one player who doesn’t have any Draw 2 action cards or a Wild Draw Four Card. The Draw 2 can be used only if they have the same color as the card on the top of the discard pile or against another Draw 2 card. Reverse: This card’s role is very simple, being able to reverse the direction of the game from counterclockwise to clockwise. If it’s draw, another player can place another reverse card upon it, if he or she has one and the game will continue its direction. The reverse card can be placed just on cards with the same color. It’s a great cards from those moments when you want to win the game and the player to your left or right has bigger chances to do it. Skip: It can be used if you want to skip a player’s turn and it should be placed on the pile only on a card of the same color. If the player whose turn is to be skipped has a skip card as well, he can use it, no matter the color. Wild Card: It can be placed on any card, no matter the color, except action cards and Draw Four Wild Cards. The purpose of the wild card is to change the color of the top card from the file, as indicated by the player who places it. Wild Draw Four card: Basically, the most powerful card in the game, it makes the next player pick up four cards from the draw pile. Also, the player who places it on the pile can indicate the color of the next card that should be placed. Still, if the player who should draw four cards has a Wild Draw Four Card as well, or a Draw 2 action card, he or she can use it in order to avoid adding four more cards to the stack. Finally, when you have just one card left in your hand, remember to say “UNO”. Otherwise, if you don’t do it and another player catches you, you must draw two cards. For any number cards, they get the numeric value. Ex: For a 3 card, they get 3 points. Tip: make sure you don’t forget to write down the scores of each round. 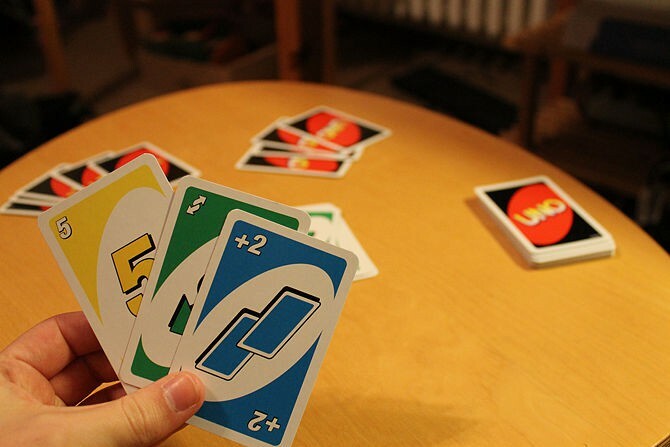 The UNO game ends when one player scores a total of 500 points. The one with the smallest amount of points wins the game. Ok, so now you know how to play UNO and you’ve been through a couple of games already. Still, it’s pretty hard to win the game, right? Well, what if we told you that winning doesn’t have that much to do with luck as it has with your style of playing? We’ve put together a list of tips and tricks, perfect for improving your UNO strategy. First, we’re going to start with a few tips for each card in the game and next, we’re continuing with some full playing strategies. Numbered cards: Make sure you have a variety of colors in your hands, in order to always have a card to play. Still, don’t forget that your main purpose is to get rid of them as fast as possible. Draw 2 Action cards: Use them if you think that the next player is getting close two winning. Reverse Action cards: Use it if you think that the next player is about to place an important card on the pile. Skip Action cards: If the next player is about to win, make he/she miss a turn and keep the current cards as much as possible. Wild card: Try to keep it in your hand until the end of the game, if there’s not an urgent situation in which you can use it. Like this, you can play your final card, no matter what color is on the top of the pile. Still, be careful to not be left with it, as it has a value of 50 points. Wild Draw Four card: Again, try to keep it in your hand until the end of the game. Unlike the Wild card, which can be used just to change the color, the Wild Draw Four card works against any card, except Skip and Reverse. Be careful to not be left with it, as it also has a value of 50 points. Ok, now it’s time for some serious stuff. If until know we have presented just a few easy tips, we’re continuing with some strategies designed to help you win any game easier. A strategy well known between Blackjack players, it can also be applied when playing UNO, even though in a totally different manner. Still, it requires a lot of your attention, since you need to keep track of everything that’s going on around you. If one player puts down a few cards of the same color, change the color being played as soon as possible, so he or she won’t be able to get rid of that many cards. If a player needs to draw cards on the same color each turn, try to keep the same color being player, in order to make him or her keep drawing cards. Try to control the color being played with Wild cards or by laying down the same number of the card player, but with a different color. For example, if on the top of the pile is a red 5, play a green 5 to have the color changed. 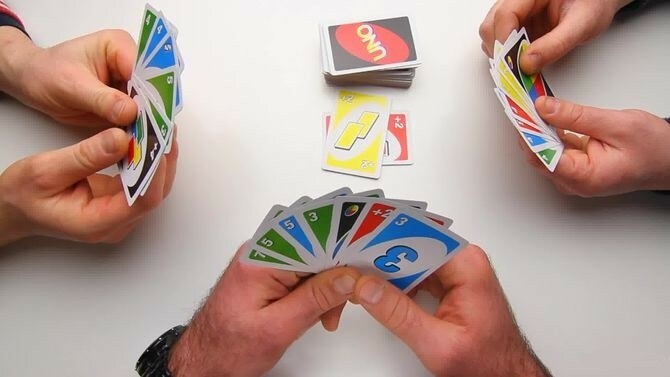 Using the Skip and Reverse cards will help you to call UNO instead of another player, but just if you pay attention of the number of cards each player has left in their hand. Basically, if they seem to be ready to call UNO, make them lose their turn with a Skip card, or reverse the direction of the game. As for the Draw Two card, it can be placed strategically. If the player before you has just a few cards left, use the Reverse card, followed by a Draw Two next round. They will play another card after the Reverse, but the Draw Two will let them with an extra card. Also, if the player who comes after you has just one card left and is about to call UNO, use the Draw-Two card to avoid this. Your facial expression can give the other players a lot of information about your cards. Try to keep it as neutral as possible. 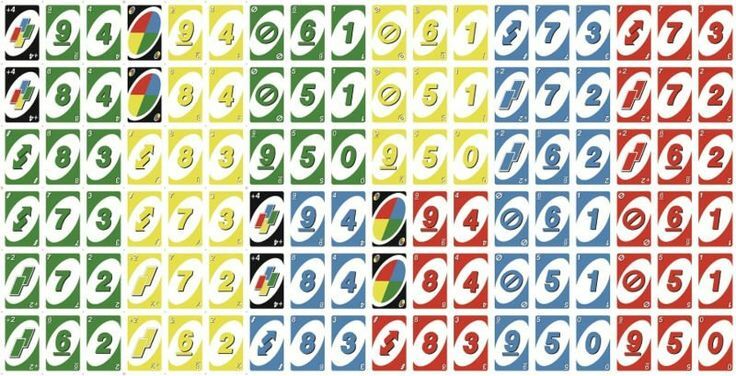 Make sure UNO is called by the players who have just one card left. If a player doesn’t say this, you can ask them to draw two cards. Still, be quick, as the challenge can be issues before the next player’s turn comes and he or she draws or puts a card on the pile. UNO can provide hours of fun and there’s no doubt that it’s one of the best card games out there. Hopefully, our guide on how to play it will make you try it, if you haven’t yet, and see how awesome it is. Also, we’re looking forward to hear from those who managed to try some of our tips. If the ones presented above turned out to be useful for any of you, let us know. Finally, we’re always open to suggestions, so if you have any other strategies or tips that haven’t been mentioned, feel free to let us know about them as well, using the comments section below.